The Argentina team said this was their final match in Naucalpan. Both men ended up bloody. Second defense for Imposible. Draw not specified. Picudo Jr. replaced Groon. Mascara faked a foul, but Mr. Electro just pinned him before the ref noticed. Warrior won via foul and with help from Mascara Ano 2000 Jr.
Villano III & Villano V were honored before the match. 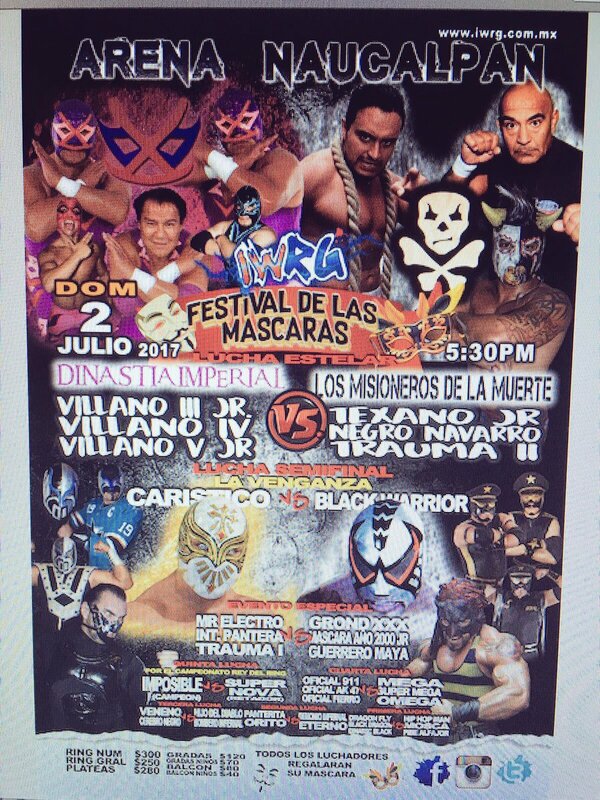 Villano V Jr. (Kortiz) debut under the new name. Bloody match, Texano fouled Villano III Jr. for the DQ. 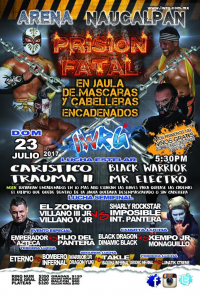 the wrestler listed as Warrior Jr. the last couple weeks is Star Warrior/Black Warrior Jr.
Dowki was suffered a head injury during the match and couldn't remember it afterwards. straight falls. Kanon replaced Dragon Fly. Hijo del Pantera betrayed Emperador Azteca (since they're already feuding.) 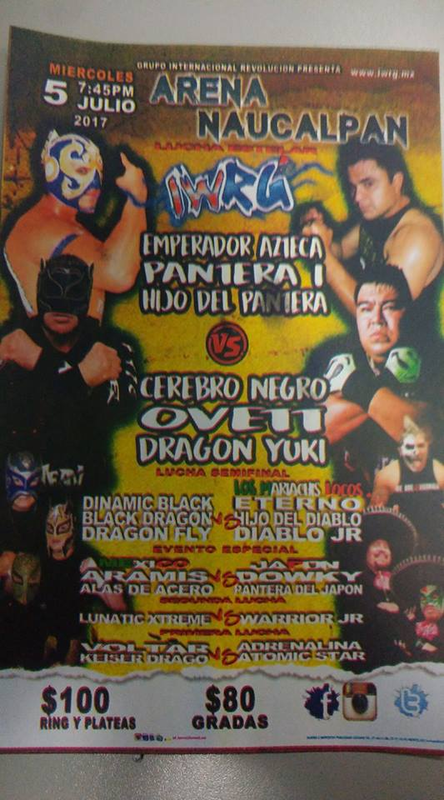 Pantera II (in the match instead of Pantera II) sided with his son and helped unmasked Azteca. controversial three count by referee Rosas. 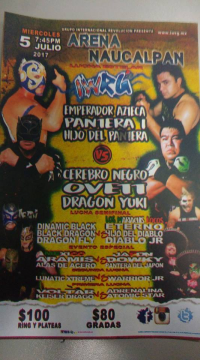 Eterno challenged Bombero Infernal, Demonio Infernal and "his other two sons, Ninja Turtles Leo & Mike"
Hijo del Pantera betrayed Pantera I & Azteca. 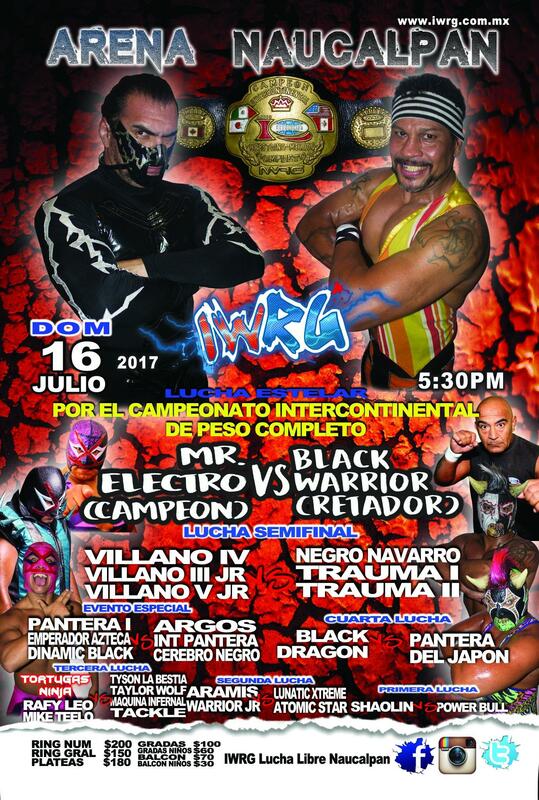 Black Warrior asked for a title shot against Mr. Electro and will get one next week. 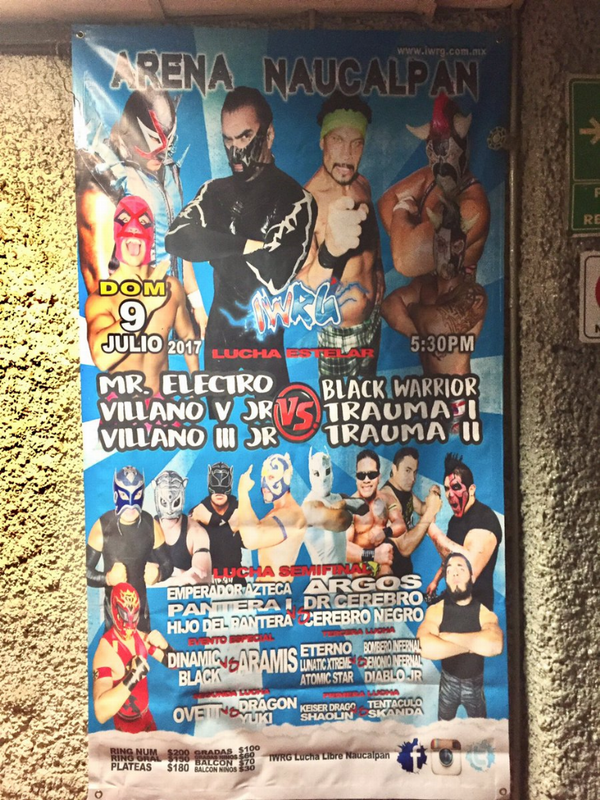 2) Demonio Infernal & Lunatik Xtreme b Aramis & Black Warrior Jr.
Pantera del Japan was listed as losing here but also as being in Guadalajara at the same time??? First defense. Lots of messiness, with the seconds fighting (Trauma II & Dinamic Black) and unmasking each other. Electro gave up, Warrior got his arm raised as the winner, then was DQed for hitting a ref earlier. Kempo & Monaguillo are from Juarez. 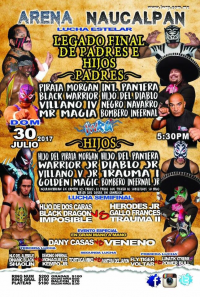 Hijo del Patnera replaced Tyson La Bestia, who didn't work either show he was advertised here this week. Kaving, in his return from fracturing his femur, replaced Maquina Infernal. Bombero used the ropes to win. Argos & Gallo Frances were added to the match. Gallo Frances betrayed Dinamic Black after problems. Pantera wants a title shot. Zorro suffered a knee injury but his team still won. 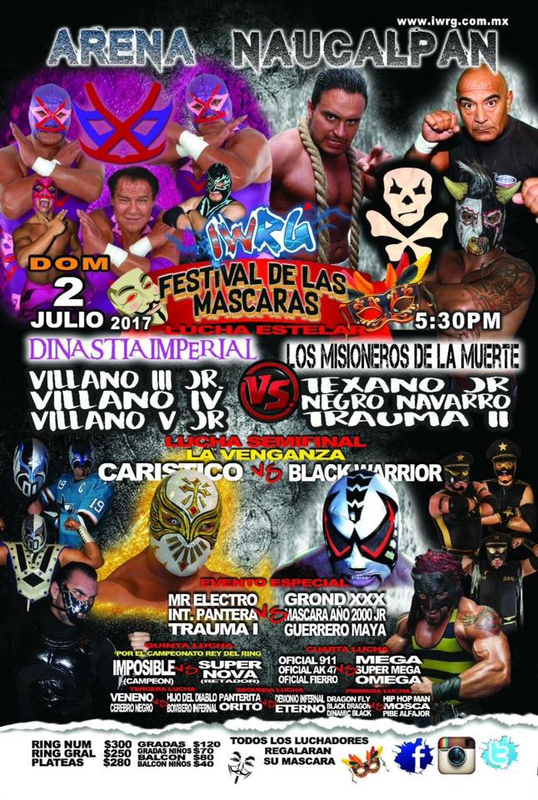 Escape order: Black Warrior, Mr. Electro, then Black Warrior came back in, Trauma II escaped, adn Caristico escaped leaving Black Warrior bald. Bonus opener. Dinamico's partner is ether Dranzer or Draxter. 2) Fireman & Puma King b Guerrero 2000 & Matrix Jr.
Gallo Frances betrayed his teammates, fouling Alrbrije. Estrellas del Ring lists Marduk as Harry Sick, from Chile like Taylor Wolf. 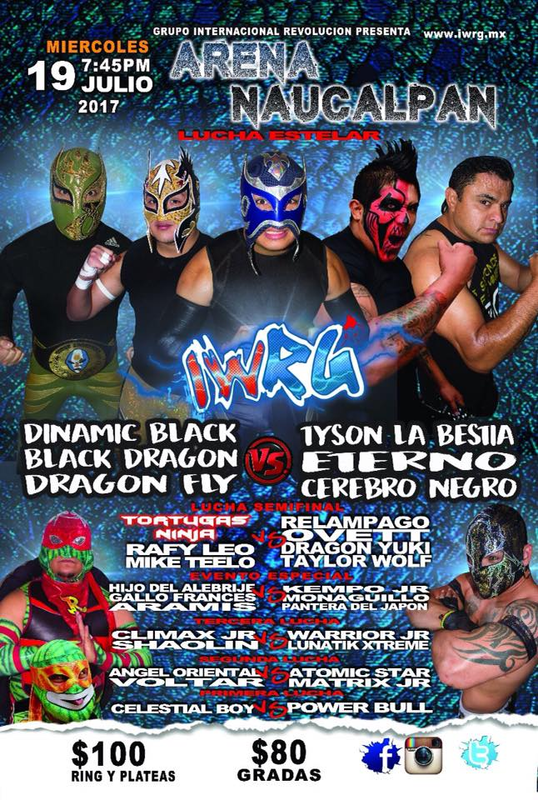 IWRG vs Indy Nation. 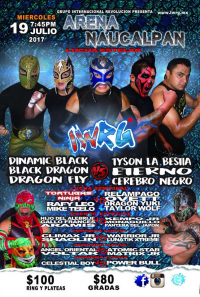 Centvrion & Latigo were listed, but Latigo wasn't there and Centvrion worked as the coach instead of Arez. 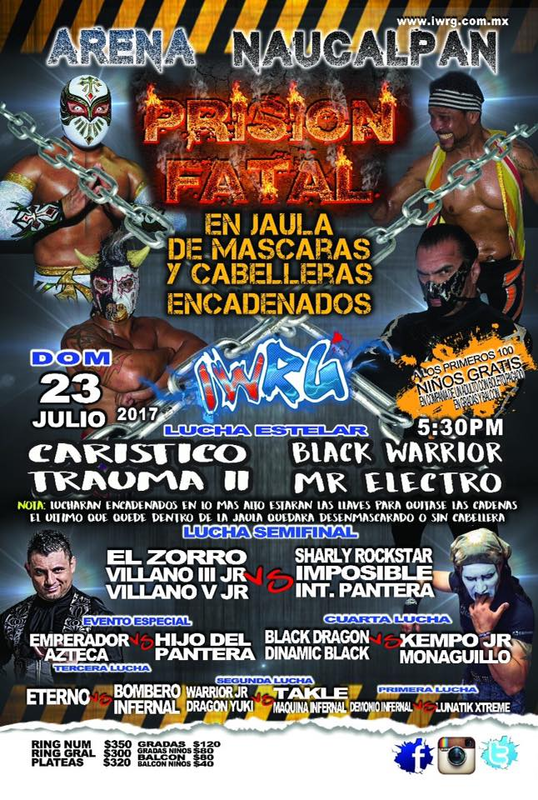 Black Terry was listed in the match by the official results instead of Demonio Infernal, but Terry was the coach. Arez beat Emperador Azteca (in a rare clean finish for one of these) to set up a title match. Mike won despite injuring his left leg. Veneno hit the referee for the DQ. 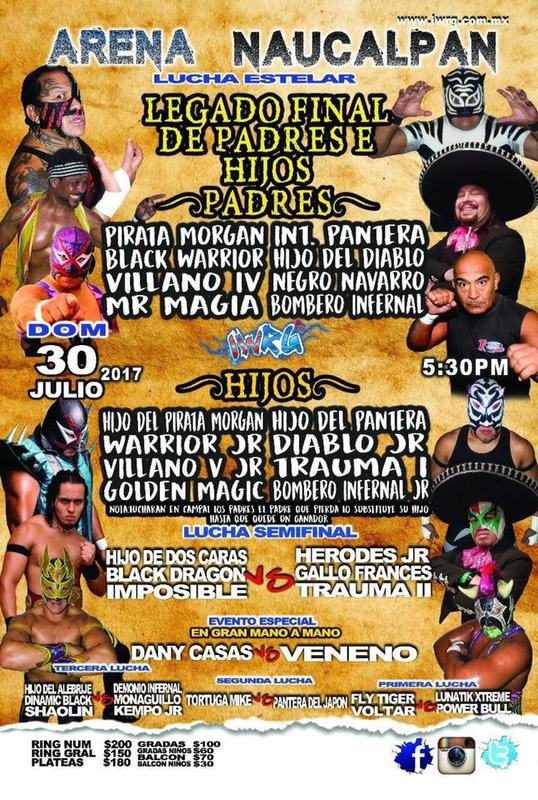 Hijo de Dos Caras wants a shot at Herodes Junior title. Fathers on each team started and were replaced by sons when they were elimianted. 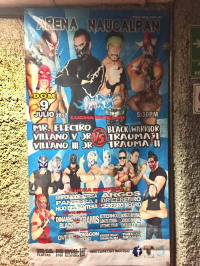 Villano V Jr. beat Trauma I for the win (though with a foul), and earned a shot at Mr. Electro's IWRG Heavyweight title.